Now is important. No matter how young you are, you don't have time to waste. Set goals, work hard, love those around you, practice kindness, view obstacles as challenges, fulfill your dreams. "The greatest surprise in life to me is the brevity of life." We didn't take very many pictures when I was little, so whoever was around got in on the fun. Big brother was in school, Baby brother was napping, so Mom took a picture of Middle brother and me on my fifth birthday. Possibly grandparents were coming over for cake when Big brother came home from school. I don't remember, but this I do know. 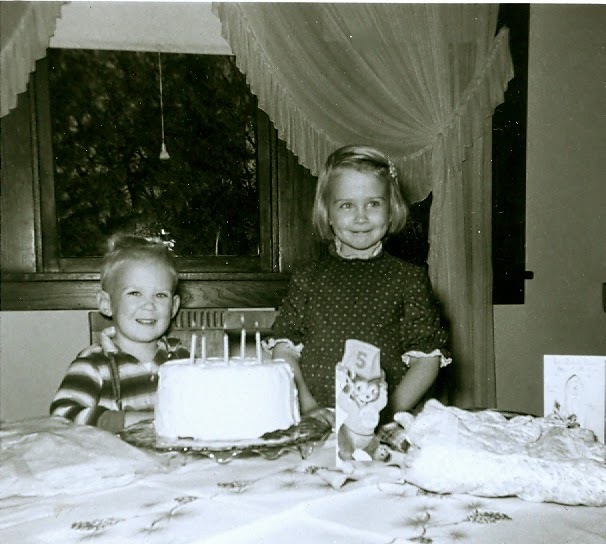 The table, the chair, the cake plate, and possibly the tablecloth, maybe even some of the clothes and the card if we dug through boxes, are still in the house where this photo was taken fifty-five years ago today. I am among the lucky few who turns 60 with both my parents living nearby in the house where I grew up. Turning five was a milestone. I was no longer a toddler, but a girl, old enough to take some responsibility. I started school, first grade, the next Fall as a five year old. Birthday milestones? I remember turning seven and treating my class to Tootsie Pops. No food police back then. I remember getting the playhouse that Dad and Grandpa built for me. There was the suede fringe jacket that marked my sweet sixteenth birthday. I still have it. It is still gorgeous, but it doesn't fit me. The first adult milestone birthday was when I turned thirty-five and I was busy. Joseph was born that day. Nearly four weeks early, it was a happy surprise when he joined the party. I expected that he would be my youngest child. That was the day when I knew that I was no longer young. I wasn't exactly old either. So my age didn't matter very much to me. As I aged, I was reassured that 40 was the new 30 and 50 was the new 35. Until today, when I turned 60. When you turn 60, you are officially old. You are not fabulous in a youthful way any longer or ever again. No one tries to pretend about that, at least no one around here. And I have to admit, it is a relief. A few weeks ago, when I realized I would indeed turn 60, I thought about trying to choose the 60 happiest days of my life. If I could choose 60 days of my life to live over, which would I turn to? There are far too many happy memories to choose only 60. Sometimes I imagine being young again. It doesn't work well, because I carry my perspective back in time with me. I can never be young again. And when I thought about the reverse... Are there 60 days I would wish away from my life? I don't think that I have had 60 very bad days in my 60 years. My life has not been perfect, but I wouldn't erase anything. Difficulties carry lessons that have made life richer and more meaningful. I wouldn't want to live with the unintended consequences of missing out on the lessons learned. What if I could have three wishes? I think I know what they would be. One of them would be a wish for more time or the ability to do things more quickly. I find I am slower than I once was. It frustrates me. I wish fairy tales could come true. I want happy endings. But I have learned that in this life all healing is temporary. Medicine is wonderful, but limited. Lazarus is dead now and that is my fate as well. My Christian faith is important and I do believe there is life after death. I have always struggled with transitions, so I can't claim much joyful anticipation for the afterlife. The best I can muster is to live with the hope of God's grace. Life amuses me. GriggsDakota agrees with me. Life at every age has been about doing my best and being my best. I expect that to continue now that I am old. I dislike winter in April, hot days before August, and dry Summers. I respect Winter for what it is. Time keeps flying by. I like dark Winter days, vacations in Florida, and my family. And liking my family is the greatest joy in my life. So thank you family, friends, acquaintances and readers far and near. Sixty will be just fine.